There’s no doubt that getting a link that passes Google juice from the authoritative, highly-ranked structure over at Wikipedia (and, by extension, its master company, Wikimedia) can be a boon to many a website. Wikipedia.com famously “nofollowed” links to all sites added several years ago because of the belief that search engine optimizers were leveraging the free encyclopedia for link building tactics. But while Google has rewarded Wikipedia for having strong content and high editorial integrity, some are pointing out that it might be possible to buy links from Wikimedia after all. Check out the Sustaining corporate donors page over at Wikimedia. There you’ll see a number of company names, of course, but you’ll also see something else most intriguing: powerful anchor text. As any SEOptimizer worth his salt knows, anchor text from a powerful source like Wikimedia can mean major search engine rankings for big-time keywords and phrases. The price for this appearance at the Wikimedia hall of links? $5000, says Ian at Boom Online Marketing. According to Ian, there is definitely some major link manipulation going on, as some of the links are to websites owned by the same company. 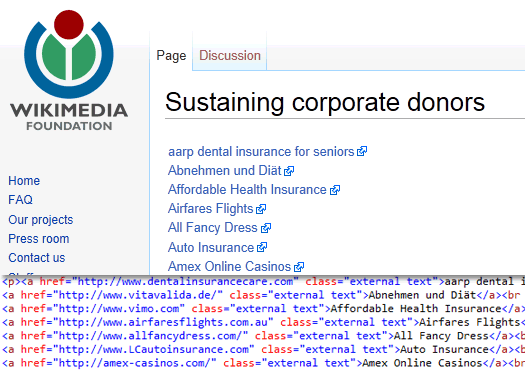 In essence, corporate donors are able to use Wikimedia in a link-building strategy. Using Ian’s figures and counting 135 links listed at the “corporate donors” site, Wikimedia has pulled in at least $675,000 from these donations alone. The PageRank of the Corporate donors site is 6, and while that’s not the end-all, be-all of Google’s algorithm these days, there’s no doubt it’s still a valuable link. Given that Wikimedia allows the donors to choose the website and anchor text of their links, there’s something oddly spammy about this whole affair, and we’ll keep an eye on it to see if Google catches on.